I've decided to join the many builders of Ivan Pettigrew's great designs and, in particular, the Solent. I'm choosing to build the Solent 400 with a 82" W.S., as the the Solent 480 at a 100" W.S. is just a little too big for me. There are several build threads already posted for this plane so I'll just post some of my ideas for some modifications of the design and some of my building techniques, for what they are worth. This will be my fifth twin motor water plane, some of my own design, but my first four motor plane and I'm excited about eventually getting it airborne and joining Ivan's "club"..
Building a three piece wing. The outer wing panels will be separated from the center section at the outboard motor nacelles on each side. Even at 82" it's a handful with a one piece wing. Using four brushless outrunner motors for power. I'm choosing to go brushless since I haven't used a brushed/geared motor in over ten years and they are getting hard to find anyway since the electric model world seems to be going brushless these days. I'm using four Turnigy Park480, 850kv motors, Turnigy Plush 25A ESCs, with Master Airscrew 3-blade 9x7 props, and one Turnigy nano-tech 3S 6000mAh pack. Making the horizontal tail surfaces removable. These are easily damaged in transit when permanently attached. The tail fin and rudder will be permanent, however. A few design changes to the fuselage, especially the nose section, to make for a more rounded, less boxey, appearance. Rudder and elevator pushrods internal. I'll try to keep any changes, and their added weight in mind, as I do the build. My target is a 6 Lb airplane but I suspect the it will be more like 7 Lb. I've bench tested my motor setup and the four motors run well together and will give me a total of 106 W/Lb for a 6 Lb plane and 91 W/Lb for a 7 Lb one. These are good numbers for a flying boat water plane getting off of the water and the plane should fly easily at half of these values once airborne, giving me good duration. Just a suggestion should you want to build the 100" version but still want to transport it easily, I built my version of a Sunderland at 90" span with removable out wing panels. The center section is also still removable from the fuselage, but is still easy enough to transport with it attached. Saves on a lot of plugging in connectors on final assembly, as even the aileron servos are still in the center section. The aileron push rod gets connected after the outer panels go on. Good luck with the built. Plug in outer panels for easier transport. I decided to wait until I had made some progress on the build before I started this thread so, at this point, with a months work, I have finished the wing construction except for glassing the motor nacelles and wing covering. I'm using 18g/sq mtr glass cloth and Z-poxy for the glass work. It's easy to do, sands easily, and is fairly lightweight. For the flat surfaces, I'm using Polyspan covering, applied with lacquer. Withthe the price of dope so high, the lacquer does a great job and is considerably cheaper. The plane will then be painted with an acrylic latex paint. Plastic film coverings are easier to use but they always seem to wrinkle after awhile when used with water planes and I can be more creative with paint. The outer wing panels are started using the previously prepared front spar with its pocket bulit on for the ply joiner. Back to the center section, the motor mounts must be modified for outrunner motors. I chose to build box mounts that slip over the finished wing sheeting. the box is left open at the bottom to allow access to the ESC and for cooling. A cover will later be installed over the opening but will be vented to allow cooling air to exit. For the rear of the cowling, the N1 former has to be left open at the bottom to allow air through. I did this by forming three narrow strips of 1/64" ply to allow the opening and still support bottom sheeting. This piece is easy to make using CA glue and comes out very strong and light. With the box in place, remaing formers were glued to it to allow support for the planking, using 1/16" by 3/8" strips. One note on motor wiring: I installed the ESCs behind the motors for the best cooling. Because this results in very long power leads I installed two sets of caps on the leads on the wing on each side and an additional set on the Y-lead for the fuselage wiring to the battery pack. These are to minimize voltage rippling in the long leads that could damage the ESC caps. 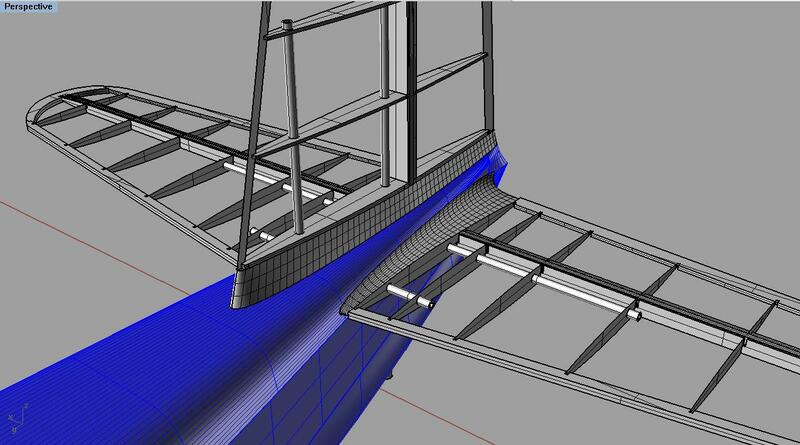 To finish off the wing, the ailerons were built according to the plans and covered with the Polyspan. My technique for the covering is to apply two coats of laquer to the balsa and let them dry. I then placed the Poly span onto the balsa surface and lightly brushed laquer thinner through the material to activate the lacquer. After the lacquer was dry I then went over the aileron with a hot air gun to shrink out any wrinkles. The Polyspan has a limited amount of shrinkage possible when heat is applied. After this, I applied two coats of lacquer to the aileron, lightly sanding between coats. The aileron control horn is part of the innermost rib and was cut from 1/16" ply. Using a ball link instead of a conventional clevis to the horn allows almost a straight line pushrod from the aileron bellcrank that was located as far possible to the rib in the center section where the outer panel joins. 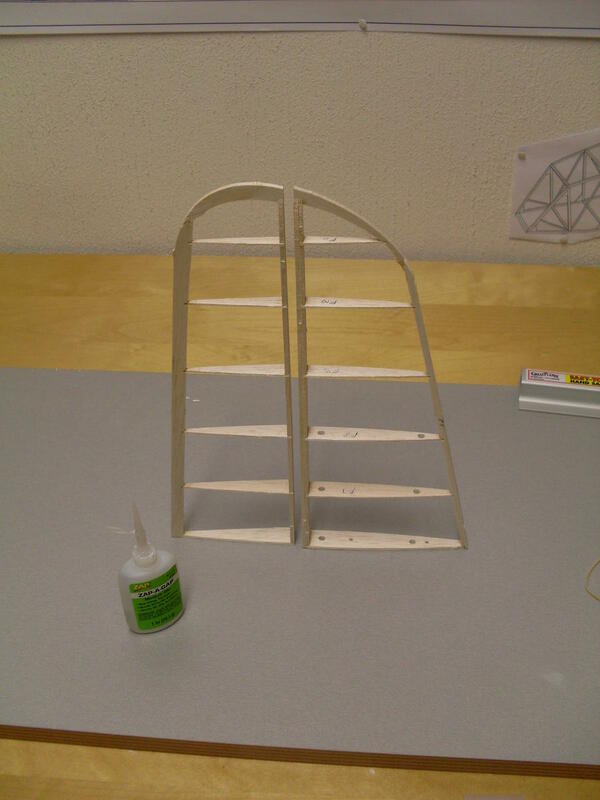 The only things left to finish the wing were the wing floats. They were built to the plans except that I used a little different keel for them. Using two pieces of 1/8" balsa I cut slots in one piece for the struts and then glued it to an uncut piece to make a pocket tor the struts to be glued into. To save weight I cut out openings in the keels. This amounted to 3 grams per float: not much, but it adds up. The floats were then glassed except for the struts which were covered with the Polyspan. Good looking plane and great idea. I have already done this on mine since I am posting after the fact. Great minds think alike, though. Hey cool another Solant. It's a great flying plane. Mine is getting a bit beat up just about time for a replacement. Great another Short bros airplane !! good build so far. I'm building a Short S23 Empire in 82.6 inch wingspan. I plan a one piece wing but also removable tail surfaces using carbon tubes. Wil be following this one , good luck with your build. Wow, true to your title this thread already does have quite a few great build ideas for this airplane, and you're only on page one! You mentioned in your second post about making the horizontal removable, I think this is a great idea. As everyone knows, I have broken my horizontal stabilizers many times. However you said the vertical and rudder would remain fixed. I would highly recommend going with what is shown on the plans, which allows the top half of the vertical/rudder to come off. The root area is still fixed as are the rudder linkages, so it is no work to remove and replace the top portion. But boy can it save a lot of space. Also lets you store the plane much closer to the ceiling later (hard to know where else to put these things other than hung from the ceiling). Anyway you are doing an excellent job and I think this thread could be a great help to others. Keep up the good work. Looks great although I have concerns regarding your wing joiners. I am a great advocate for ply wing joiners slotting into the recess between the spars. I use it quite a lot, on both my IP Mosquito and MiniCat which I have built in a similar fashion to the direction you are going. I also use it on fuel powered models too with no issues. My concern is that you have drilled holes in your joiner to loose weight, in doing so you have compromised the strength of the joiner. For the amount of weight lost by doing so I think this is a false economy and set the machine up for a structural failure. Mine normally are solid and run over 2 ribs in either direction, yet I did manage to break a solid one last weekend. Admittedly I really should not have been maidening a new machine in 25-30mph winds but I still managed to snap the joiner which actually saved damageing the wing panel too badly. Sorry for the downer, but I would rather make the comment now rather than say I thought so after an incident.